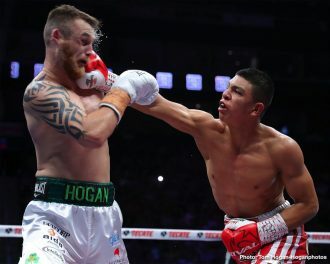 Jaime Munguia (33-0, 26 KOs) retained his WBO Junior Middleweight World Champion against mandatory challenger Dennis “Hurricane” Hogan (28-2-1, 7 KOs) via 12-round majority decision victory in front of a packed house of fans at Arena Monterrey in Monterrey, Nuevo Leon, Mexico. 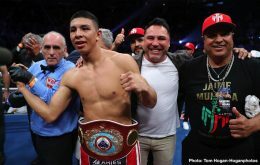 One judge scored the fight a 114-114 draw, while two judges saw Munguia winning the fight with scores of 115-113 and 116-112. 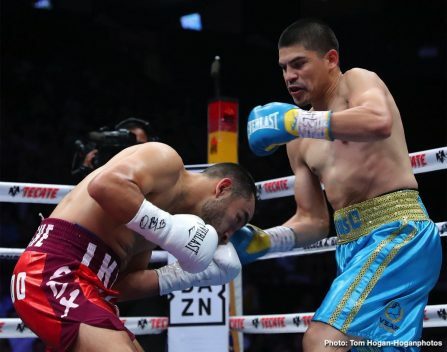 The battle was streamed live exclusively on DAZN. 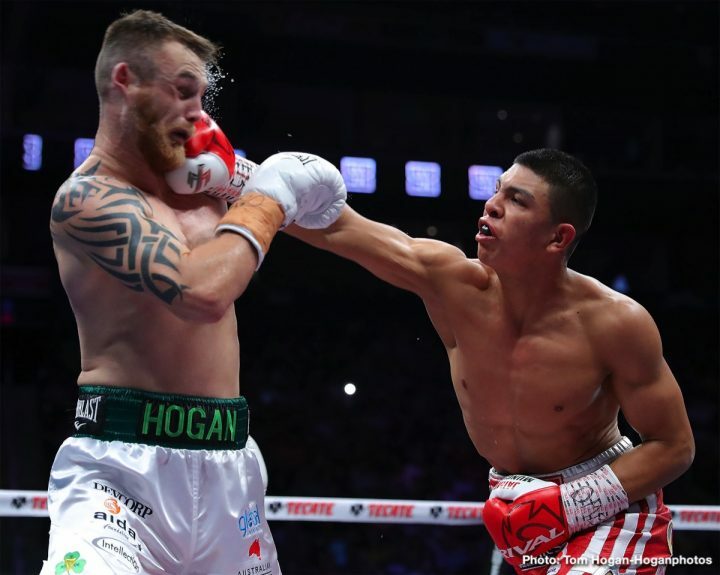 READ Abel Sanchez lashes back at GGG, calls him "greedy"
In the co-main event, the scheduled 10-round featherweight battle between Diego De La Hoya (21-0-0-1, 10 KOs) of Mexicali, Mexico and Enrique Bernache (24-12-0-1, 12 KOs) of Guadalajara, Mexico ended in a no contest at 2:25 of the second round. The fight was stopped after a clash of heads caused a nasty cut on Bernache’s forehead. 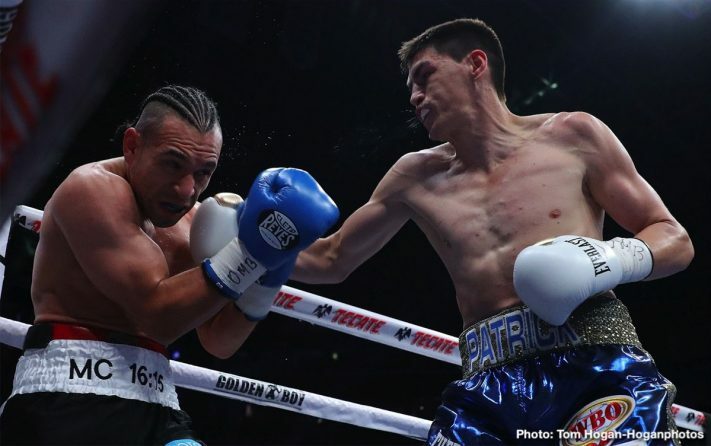 Patrick Teixeira (29-1, 22 KOs) of Sao Paulo, Brasil retained his WBO Latino Junior Middleweight Title with a 10-round majority decision win against Enrique Bernache (24-12, 12 KOs) of Guadalajara, Mexico. 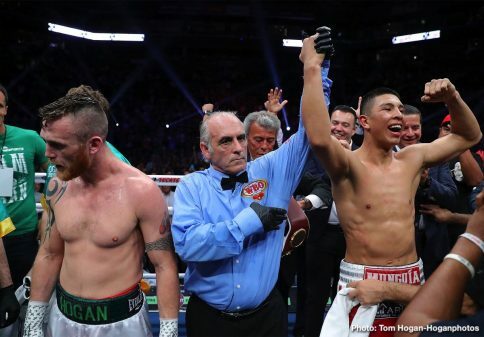 The judges scored the fight 95-95, 96-94, and 96-94. 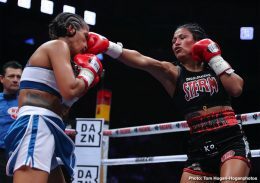 Boxing on DAZN returns with an action packed weekend on Friday, April 26 at The Forum for the rematch with WBC World Super Flyweight Titlist Srisaket Sor Rungvisai defending his belt against Juan Francisco Estrada. 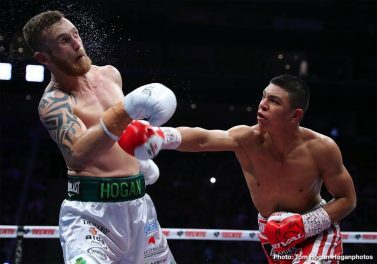 On Saturday, April 27 from Lafayette, Louisiana, #1 World Ranked Junior Welterweight Regis Prograis takes on WBA Junior Welterweight World Champion Kiryl Relikh in the semi-finals of the World Boxing Super Series.